Although these little beauties can't be offered as our "premium" pocket gems, they are still a wonderful, and now VERY affordable, recovery gift! Each of our premium gems are hand selected for size, shape, and finish! Out of each lot of gems, only a few can make the cut and can be made into our first quality, premium gems! As a result, we end up with quite a few smaller, slightly irregular shaped gems! These we are now offering to you at a truly wonderful price! Buy one or more! The more you purchase the lower the individual gem price! Quantity discounts are built in and will be reflected prior to final checkout. Only available in ONYX BLACK this time around! Quantities are limited! 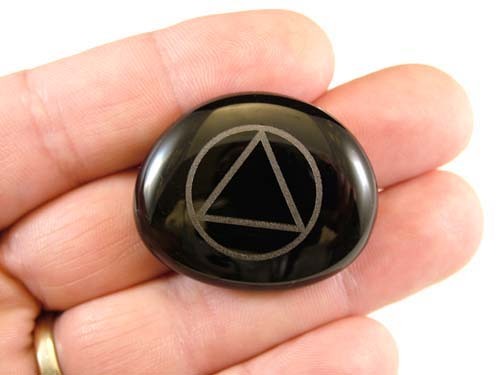 Each of these black recovery gems gets laser etched with our Circle and Triangle symbol (.8" diameter graphic) - a constant reminder of our fellowship and the program that offers us our daily reprieve. It's a perfect and special recovery gift for friends, family members, sponsees, sponsors... or, what the heck - you could even keep it for yourself!